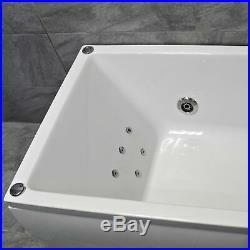 Sadie slim end tap hole bath range. Manufactured from lucite acrylic sheet as used by the worlds leading bathroom. 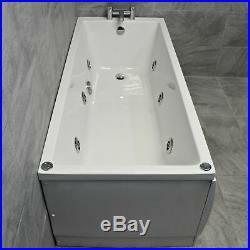 With ultra slim rim for extra bathing space & a contemporary look. Includes legs & adjustable feet. Supplied un-drilled for tap holes, can be easily drilled on site by your plumber. 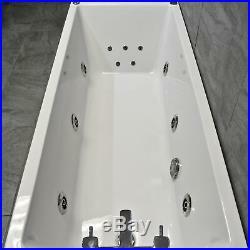 This is bath is designed for use as an end tap hole bath. 6 jet whirlpool option includes. 6 large hyflow whirlpool jets. Fully adjustable jets with chrome finish variable controls. Must be fitted to current electronic regulations. Fitted in our own UK based whirlpool factory. 11 jet whirlpool system includes. With 5 micro back massage jets. Due to the slim edge of the bath a light is not available. 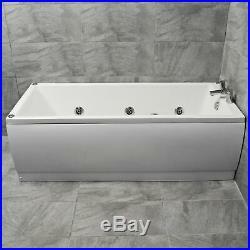 Bath panels can be added at extra cost using the options. 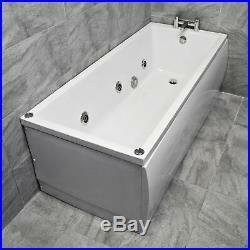 Front panels come 1700mm length (to be cut to size by your plumber for the 1500mm bath). White gloss panels are manufactured from styrene. Front & end panel option can be added if both are required. (Tap & waste NOT included). Small items are normally sent by a 3 5 day courier. Vanity units, shower trays, toilets. The pallet will be left with you to dispose of. 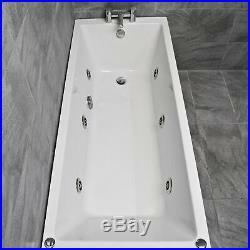 Bathroom suites, shower cubicles, baths. Compare the Bathroom have a huge range of items from stock.